Marin Academy’s Theater Program presents their Fall Theater production of William Shakespeare’s Twelfth Night. Written at the dawn of the 17th century, Twelfth Night, or what you will, is Shakespeare at the height of his comedic and romantic brilliance. With a plot riddled with disguises, mistaken identities, gender-bending intrigue, and saturated in the intoxicating and irresistible force of love, Twelfth Night is Shakespeare’s brilliantly layered, kaleidoscopic opus on the madness of the human heart. 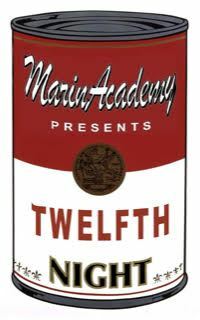 Marin Academy’s Theater Program presents their Fall Theater production of William Shakespeare’s Twelfth Night. Written at the dawn of the 17th century, Twelfth Night, or what you will, is Shakespeare at the height of his comedic and romantic brilliance. With a plot riddled with disguises, mistaken identities, gender-bending intrigue, and saturated in the intoxicating and irresistible force of love, Twelfth Night is Shakespeare’s brilliantly layered, kaleidoscopic opus on the madness of the human heart. Set in a mod, mid-sixties, Warhol-esque world, throbbing with pop music and exploding with the energy of a growing counter-culture, MA’s production of Twelfth Night features an all-star cast and live music. Thursday through Saturday, November 1st, 2nd, and 3rd at 6:30 p.m. at the Marin Academy Performing Arts Center.